Discover Wonder! Creative music, art & science and theater enrichment for infants, toddlers, preschoolers, and elementary age kids. Weekly classes, drop-in art studio, vacation and holiday activities, summer mini-camps, birthday parties, scout troop badges, creative play dates for any age. Whatever the program, every child will experience respectful, nurturing teachers, cozy class sizes, and moments of joy and discovery. Beautiful eclectic creative toy store and classrooms in Oyster Bay. Additional Music Together Center locations in Babylon, Garden City, Huntington, Manhassett, Massapequa, Plainview & Sea Cliff. Music, art & science enrichment for infants, toddlers, preschoolers, and elementary kids. Classes, holiday vacation and summer programs, parties, play dates, and a BEAUTIFUL creative toy store! 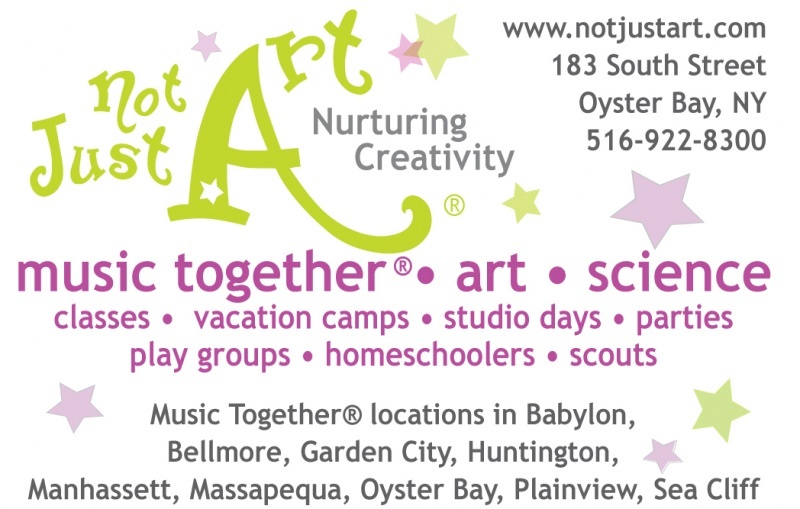 Not Just Art is an art enrichment center for children from infancy up to age 12; in addition to the art classes it provides, Not Just Art also operates a toy store and hosts birthday parties for children. Programs include theater arts, pre-school enrichment, music, art, science and after-school. The art studio welcomes drop-ins, and the specialty toy store features art supplies, musical toys, books, CDs, DVDs, science materials, games and puzzles. More than ever, children need places to wonder, discover, play, create, experience joy, and express their ideas! Engaging natural curiosity and imagination is the heart of our Music Together®, art, and science programs. Inclusive hands-on activities emphasize learning process over product and performance. Staffed with experienced teachers, classes are developmentally appropriate and thoughtfully designed to nurture children and their families at each age and stage! Infants, toddlers, pre-kindergarten, elementary, flexible classes, camps and workshops. Music Together ® locations in Nassau and Suffolk. Mara Esposito became the Director of Education for Not Just Art in 2002. An award-winning former Seattle teacher with a background in human development and alternative education models, Mara has 20 years experience joyfully developing imaginative curriculum with students in preschool through graduate school. Eva Regulski has grown with Not Just Art since its beginning in 1992, eventually becoming the center's General Manager and Registrar. With a background in Communications, Eva is a master multi-tasker who loves working with families and children on a daily basis.